Lightening network is a layer 2 scalability solution for bitcoin and other bitcoin-like cryptocurrencies. The Lightening protocol allows for fast and cheap micropayments and is seeing rising adoption as the number of lightening network nodes has grown to over 2500 in about 6 months. To demonstrate the power of Lightening, twitter user @LightningK0ala decided to put up a project akin to early internet era "Million Dollar Homepage" - a website that used to sell pixels on a 1-million-pixel canvas for 1$ each, got famous for the idea and earned 1 million dollars. 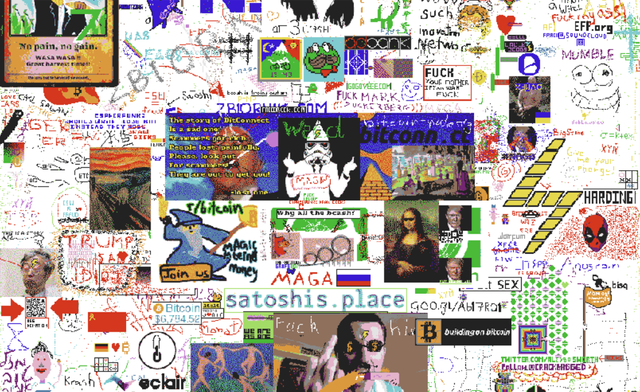 satoshis.place instead lets you buy pixels for much cheaper - only one satoshi per pixel (about 0.007 cents at the moment of writing this article). The only trick is that you have to pay with a wallet that supports Lightening, for example Eclair Wallet. Pixels can be painted over, so it's not a good suit for advertising, but it happened to be a good place for memes and NSFW pixel art.